The James R. Boyce Affordable Housing Competition Studio teams and symposium participants. Carol Galante, Faculty Director of the Terner Center and the I. Donald Terner Distinguished Professor of Affordable Housing and Urban Policy at CED leads the panel discussion at the Studio Symposium. In spring 2018, David Baker (M. Arch. 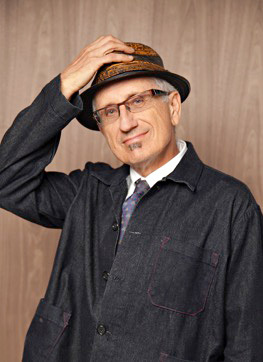 ‘82) and Daniel Simons co-taught the James R. Boyce Affordable Housing Competition Studio. Led by Carol Galante, I. Donald Terner Distinguished Professor of Affordable Housing and Urban Policy in the College of Environmental Design and Faculty Director of the Terner Center for Housing Innovation, the James R. Boyce Affordable Housing Studio aims to give students the opportunity to work in interdisciplinary teams and learn from leading practitioners to design solutions targeting the affordable housing crisis. 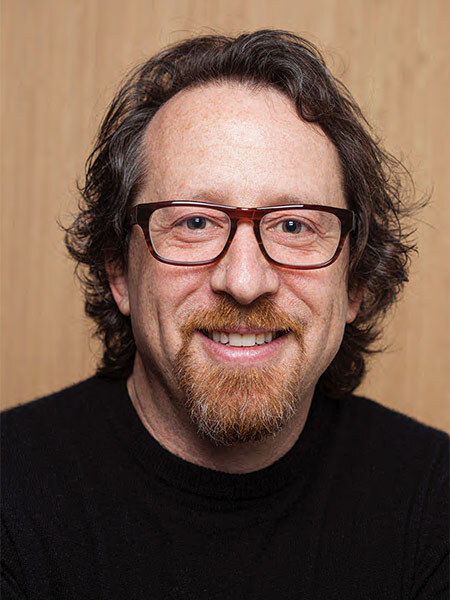 Generously funded through a gift from CED alumnus James R. Boyce (M. Arch. ’67), the studio is a realization of Boyce’s vision to promote the design and construction of low-cost housing worldwide through student competition. The spring studio was the second time the course had been offered. 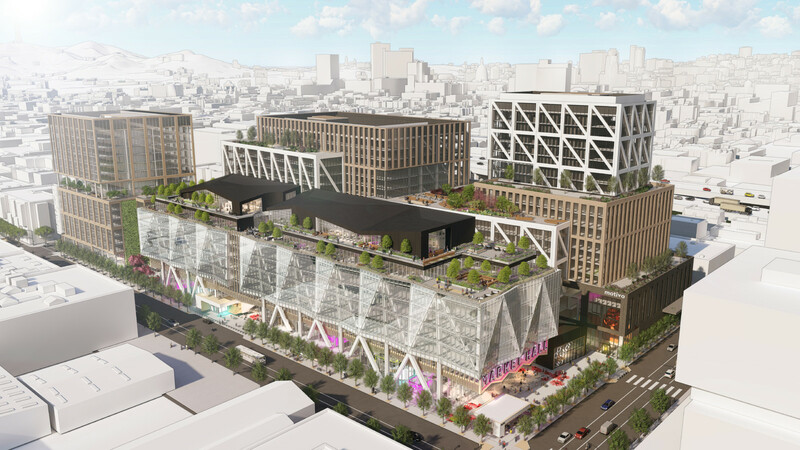 Six teams of four to five students each focused on one of two potential sites selected for development — in San Francisco’s South of Market neighborhood and in Downtown Oakland. 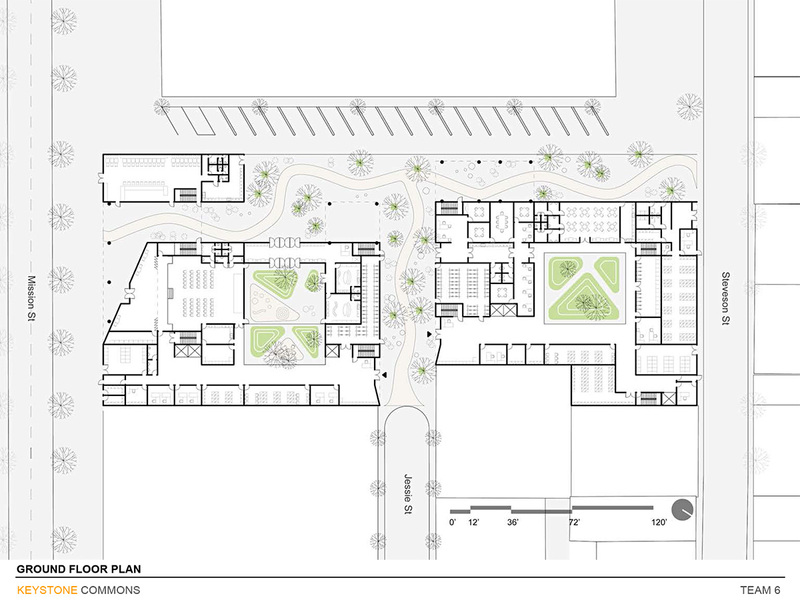 As they developed their proposals, which included intermediate deadlines for sub-scopes of the project such as interior common area designs and unit plans, staff from DBA provided feedback through desk critiques, and a jury of experts reviewed mid-term presentations. 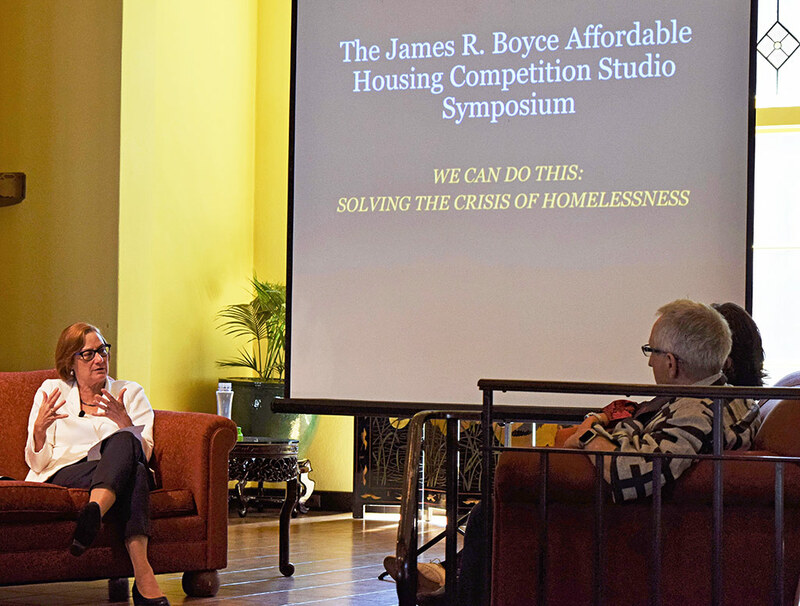 The symposium also included a panel discussion — We Can Do This: Solving the Crisis of Homelessness, moderated by Professor Galante — with presentations by Angela Brooks, FAIA, Managing Principal at Brooks + SCARPA, Los Angeles; Brad Wiblin, Senior Vice President at BRIDGE Housing; David Baker, FAIA, Principal at David Baker Architects; and Tomiquia Moss, Chief Executive Director of Hamilton Families. 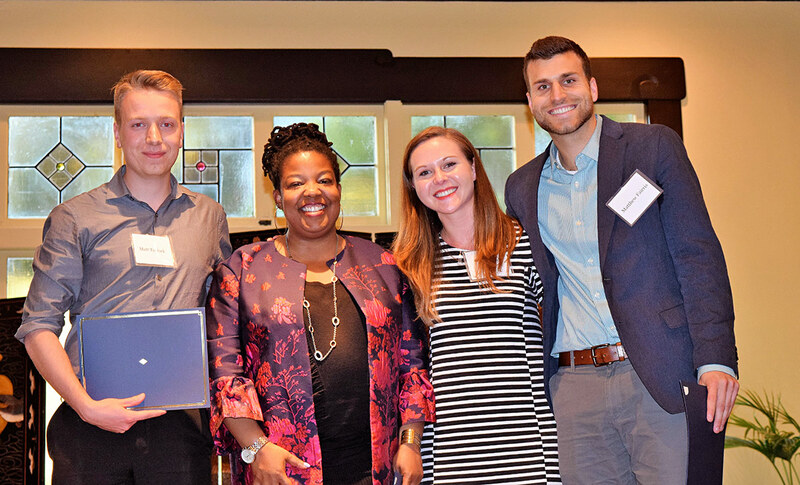 Tomiquia Moss, Chief Executive Director of Hamilton Families, presents awards to Matt Turlock, Fiona Ruddy, and Matt Fairris. 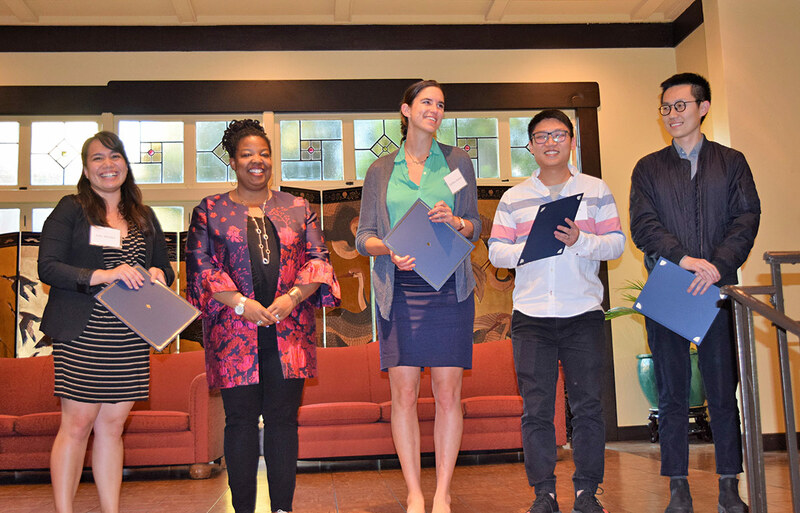 Award winners Julie Mendel, Cynthia Armour, Yang Liu, and Weinan Huang with Tomiquia Moss. The jurors selected two winning presentations. 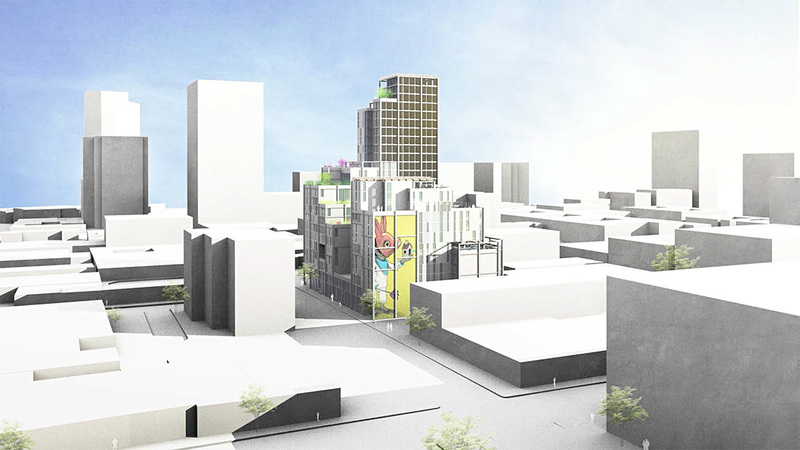 Designed for the South of Market site, “Keystone Commons” by Cynthia Armour (M.C.P. ’21), Julie Mendel (M.C.P. ’20), Weinan Huang (M.Arch ’19), and Yang Liu (M.Arch ’19) includes a total 263 affordable housing units, with units dedicated to veterans and transitional-aged youth. Sited in Downtown Oakland, “The Ebell” by Matt Fairris (M.C.P. ’20), Fang Fang (M.Arch ’20), Fiona Ruddy (M.C.P./M.P.H. 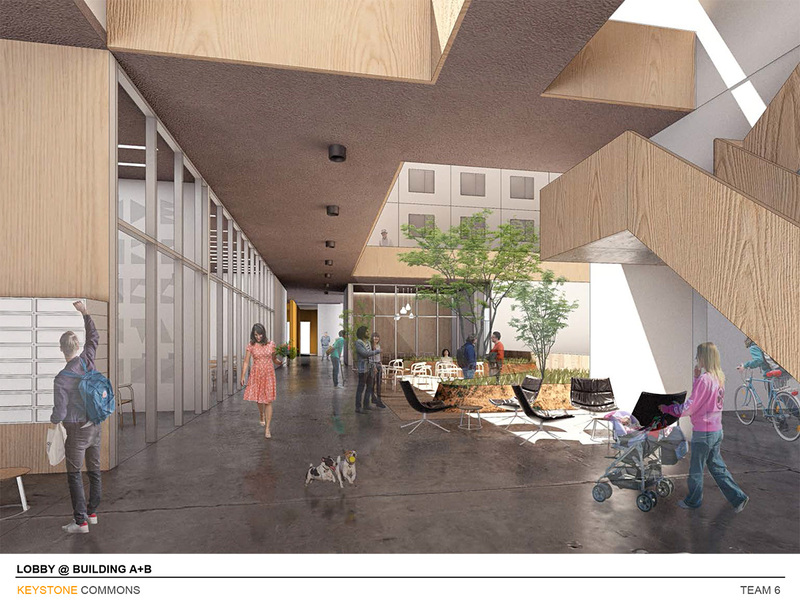 ’18) , and Matt Turlock (M.Arch ’20) is a supportive housing development for 79 pregnant women and families with children under five experiencing homelessness, inspired by the values of the Ebell Women’s Club. Cash prizes of $5000 were awarded to the two winning teams. In a nice twist, the Ebell Team members all pitched in and donated $1000 of their prize to the Homeless Prenatal Program whose staff were helpful as they developed their scheme. 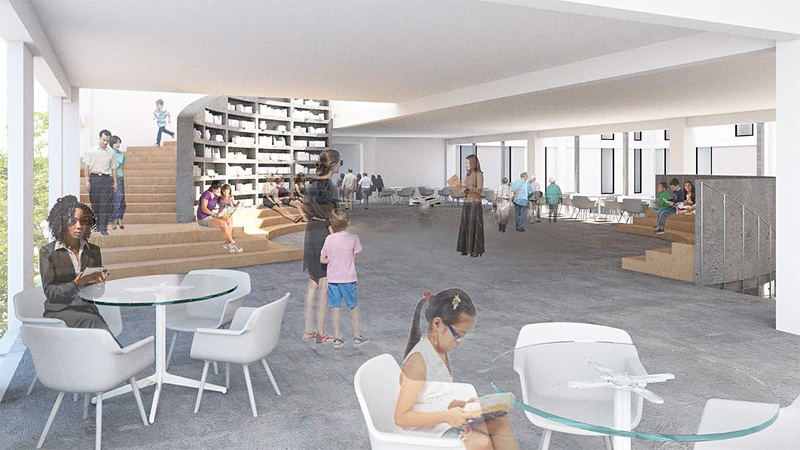 For more detail and to view each of the projects, visit the Turner Center for Housing Innovation website.